For me, shelling peas is exciting. Watching the number of little green marbles grow in the bowl in front of you, knowing what they promise. I have to restrain myself from eating them before they land in the bowl. You have to check that they are as fresh as they look, right? The Venetians so appreciated fresh peas that risi e bisi—literally rice and peas—became their unofficial national dish. It was served every April 25 at the Doge’s banquet to celebrate the feast of San Marco. I follow suit, wherever I am and look forward to eating it as much as I do to Christmas. 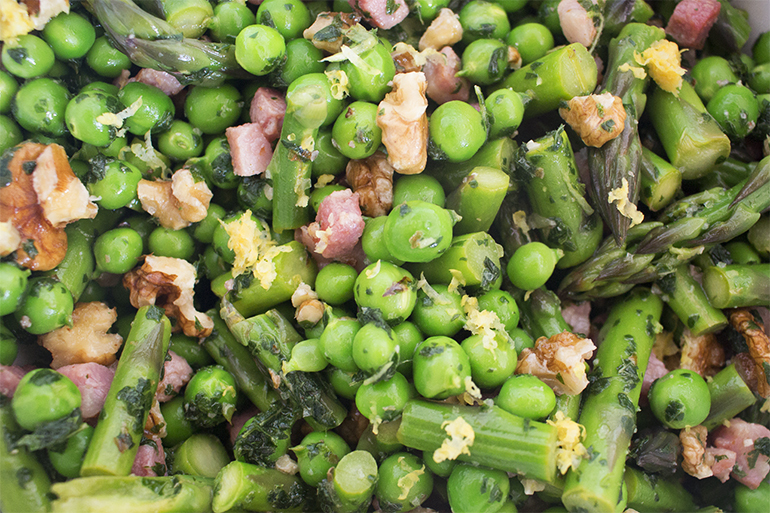 I made this salad this week as I couldn’t resist buying the peas but wanted to save my risi e bisi for San Marco. I decided therefore to combine them with some asparagus, this month’s other new rider on the seasonal market merry-go-round. With some mint fresh from my herb garden, some pancetta for colour, some seasonal lemon, and some walnuts for texture it’s something you can make quickly and easily. Note that I blanched the peas and asparagus for a few minutes to bring out their flavour but only just as I wanted them to retain their natural crunchiness. Shell the peas and place them in a bowl. Pour boiling water over them and leave them for two minutes. Drain and allow to cool. Chop the asparagus up into small pieces. Pour boiling water over them and leave them for five minutes. Drain and allow to cool. .
Heat a non-stick frying pan over a medium flame and then add the pancetta cubes and half the walnuts. Cook for about five minutes until the pancetta is a pastel pink colour. Remove from the pan and allow to cool. Chop the mint finely and combine with the lemon juice and olive oil do make a dressing. Place the peas, asparagus, pancetta, and the rest of the walnuts in a bowl. Mix together and then add a little salt to taste. Pour the dressing over the top and mix well. Season with a little freshly ground black pepper and leave in the fridge for at least one hour for the flavours to combine. Sprinkle with the lemon zest and serve.